Frances Beatty in Squamish, BC. Shot by Tara Lilly Photography. I’m a thirty something wedding photographer living in small town Ontario with my husband. Being a wedding photographer can have some serious travel perks. Besides being flown out for weddings & elopements in exotic locations, being able to take your work with you everywhere you go and having a worldwide network of colleagues, I also get a few months every year that are a bit slower so it means my travel bug can be satiated. Luckily, my husband has a pretty similar slow season, so I’m not having to travel solo all the time. Traveling is a really great way for me to press reset. I feel like it clears any inspiration rut and helps me bring more to my clients and to my own art. It’s also just a brilliant way of meeting new people. I can hermit pretty hard during my peak season as I edit all my sessions, so reminding me that awesome people do exist out there is pretty key to staying connected with humanity and staying sane. My next destination. Always. Right now that’d be Edinburgh because I am literally sitting on a plane right now. But if you asked me again in a month, or even a week, the answer would be different. OnePlus 3 Dual SIM Phone: Besides being a kickass phone that I can’t live without, it has two SIM slots so adding another SIM while traveling is super easy and convenient. Getting a SIM is now my first stop no matter where I go. I got the super slim wooden case for it which is a must, as I'm klutzy. It's small but it keeps it protected. Lush Shampoo Bar: I’m obsessed. I use it all the time at home too. I like that I no longer need shampoo and conditioner and I get to take my shampoo with me while I travel. I have a strict carry on only policy when I travel so having a shampoo bar means I get to keep using a product I know without dealing with travel sized bottles or spills. Plus it smells good. Avoid the mistake I made and get the square tin instead of the round one. Turns out the bar fits a little too well in the round tin and it's hard to get it out. (View the Pack Hacker review of the Lush Shampoo Bar). 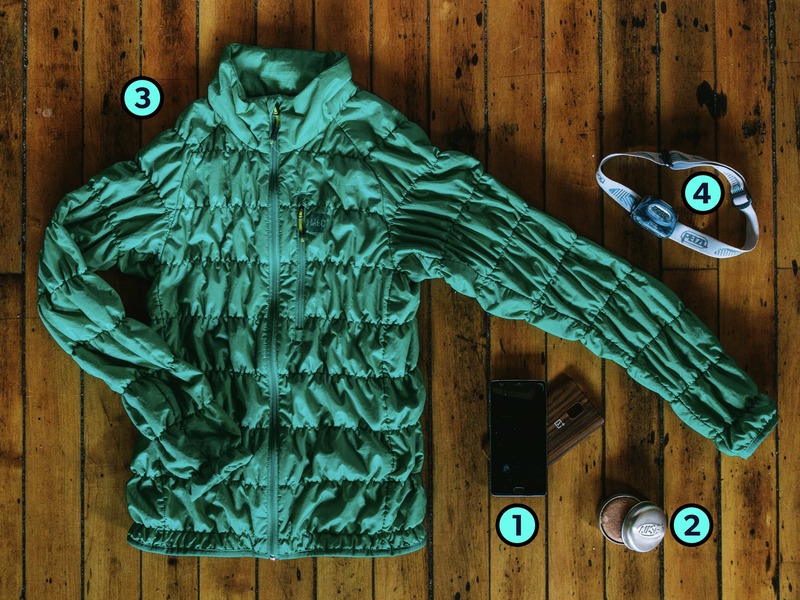 MEC Uplink Jacket: This jacket packs super small, but it's super warm, so it’s ideal. I also stuff it full of my clothes for a pillow on the go. I was told I was crazy for packing it for our recent Thailand trip, but it was used more than once. Those night trains are chilly. Bonus: Petzl ACTIK Headlamp: I keep this headlamp tucked in my jacket pocket … because … well … you never know. I like to bring a box of nice chocolates for the flight attendants, especially for those long flights. My brother-in-law introduced me to the idea. Sure, sometimes it gets you extra attention and love from them, but it always always always brightens their day. They don’t have an easy job and deal with a lot of stressed out people, so why not do something a little nice to say thank you? I just wish the babel fish actually existed. I want to be able to stick one of those things in my ear and understand everything. Although … I may not have tried that delicious soup with congealed pigs blood in it had I known that's what it was. So, pros and cons. Also . . . I need someone to make me a camera that weighs less than a couple pounds, is completely waterproof but packs the same punch my DSLR does. C'Mon Fuji … I'm looking at you. For work trips, I travel with my Canon 5DIV, Canon 35mm 1.4, and 50mm 1.8, Canon 600xl flash, my Pelican Case full of extra SD cards. I have a very rudimentary system in place to let me know which SD cards are full and which ones are ready to use—upside down for full. So simple, but I feel like a genius! SDs are so easy to lose and I know most are meant to be waterproof, but who knows, right? The pelican case is good for peace of mind. On trips just for fun I usually take my Fuji x100t. It’s a super small mirrorless rangefinder. It’s just too restrictive for any type of wedding or professional portrait shoots. But I’m trying the Fuji xT2 and may change up my travel kit if it works for me. Salad. Oh my gosh salad. I mean … I miss my bed, of course and my husband when he doesn’t come with me, but most consistently … I miss a giant leafy green salad. It doesn’t matter if I’m back country camping in Algonquin, or backpacking in South East Asia, or shooting a wedding in Jamaica … Guaranteed on the flight home or paddling that last leg against a headwind, I am crushing on salad hard. I'm pretty ready to head back to the west coast, especially if it means more adventures with awesome people. I’m stealing my husband’s advice here. He used to work in a shop selling backpacks and dealt with back packers everyday. Before you head anywhere, pack your bag with everything you’re going to need. Great! Now cut it in half. My current backpack is the PRVKE 31 photography bundle from WANDRD. It's only 31L including space for your laptop and camera. I thought it was crazy at first, but it turns out it’s more than what I need. As long as I have clothes on my back, a camera and a passport, I’m basically set. You can find Frances’ photography on Facebook or her Website.